Serge Ferrari Fabrics | Get a quote | Lightweight Manufacturing Inc.
Serge Ferrari fabrics have a number of advantages which make them very popular for architectural fabric applications: there is the Ferrari Précontraint system which pretensions the yarns in both directions equally during coating. This gives the fabric balanced properties between the warp and fill direction. Most PVC coated fabrics have more stretch in the fill direction which limits the design options. The Ferrari Précontraint system also minimizes the total fabric stretch under a given load. Finally, the reputation of the Serge Ferrari brand name and the history of longevity is an important factor for many customers. The quality of the coated fabric is one of the most important factors in the longevity of a fabric structure, but manufacturing quality during cutting and welding also plays a big role. Lightweight Manufacturing has both the experience working with Serge Ferrari fabrics, as well as specialized equipment for working with the high-end fabrics, especially the TX-30 fabric. Serge Ferrari Precontraint fabrics, like many others, exist in different weight/strength combinations. Serge Ferrari Precontraint fabric can generally be used with a lower weight for the same performance because the coating coverage on top of the yarns is greater due to the Précontraint system. This makes the scrim flatter, less coating is “lost” between yarns, and more coating is available on top of the yarns to protect them from harmful UV for a given weight. 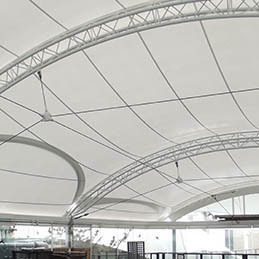 In the design of a fabric structure, the engineers will determine the minimum required fabric strength, based on minimum safety factors that are required. When a stronger fabric is selected, it will result in more longevity for the scrim since the scrim can lose a larger percentage of its strength before it fails, since there is more strength to start with. However, in many cases, the longevity is determined by the surface of the fabric becoming so weathered that fabric replacement is required from an aesthetic standpoint. In that case, using a stronger fabric does not necessarily prolong the fabric life if the topcoat is the same between the heavier and lighter fabrics. Fabrics with a stronger scrim will generally stretch less under a given load. Lightweight Manufacturing assists their customers in fabric selection, making sure they get the best value on their unique project. Some of the most popular Serge Ferrari fabrics we work with are listed below. The product names have recently changed and below are the new names. In case of doubt please contact us or Serge Ferrari to clarify the new name of a specific product that you have used in the past. Ferrari Flexlight Classic 602 fabric is Precontraint and is suitable for high-quality fabric structures. It combines excellent strength with minimum weight for maximum install and transport productivity. The topcoat is acrylic, suitable for less demanding applications. The acrylic topcoat seals the PVC coating and prevents plasticizer migration. Ferrari Flexlight Classic 602 is available in the USA as an opaque white or tan in 22oz weight, or in a translucent version in a range of colors. Compared to 502 S2, it has similar strength, more weight but a more economical topcoat without PVDF. Ferrari Precontraint Formula S2 is a calibrated acrylic- PVDF topcoat that combines weldability with improved resistance against soiling. 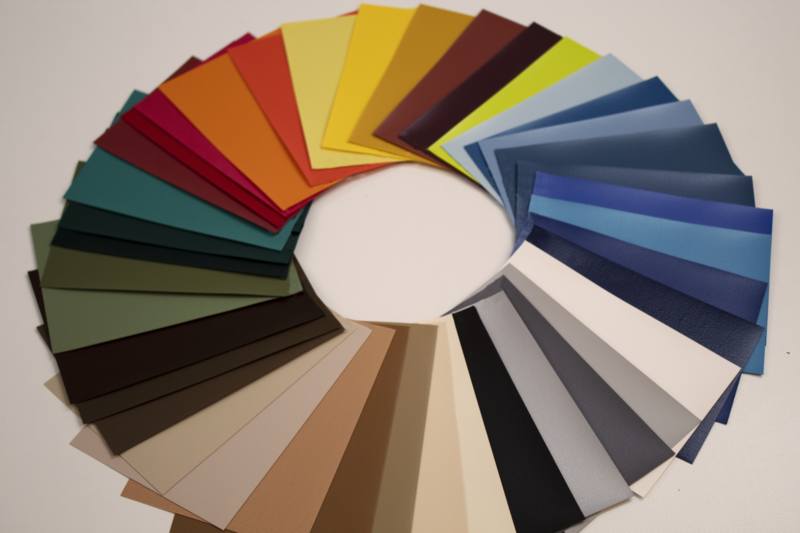 Ferrari 702 fabrics also exist in an aluminum surface finish with acrylic topcoat. Ferrari Precontraint TX-30 is a pure PVDF, cross-linked topcoat that is not weldable. It is a PVDF coating that maximizes the self-cleaning properties and improves the longevity of the fabric. The TX-30 topcoat is not weldable, but Lightweight Manufacturing operates special equipment that grinds off the topcoat in those areas that need welding. Ferrari Flexlight Advanced 902 Formula S2 fabric is suitable for high-quality permanent fabric structures. The Formula S2 topcoat provides a calibrated PVDF layer to enhance the surface properties and extend the life of the fabric. The strength is higher than the Ferrari 702 fabric, with a comparable amount of coating coverage on top of the yarns. Ferrari 902 is considered a type II fabric, while Ferrari 702 is a type I fabric. This classification is part of the classification system that divides architectural fabrics into 5 strength classes, from type I through type V.
Ferrari Precontraint 832 fabric is suitable for industrial applications. The strength is the same as the Ferrari 902 fabric, with slightly less coating and an acrylic topcoat. It is available in a range of colors. Ferrari Precontraint 1002 Formula S2 fabric has the same strength as the 902 S2 fabric but provides a heavier coating weight. Ferrari Precontraint 1002 is also available with a TX-30 topcoat (Serge Ferrari Flexlight Xtrem TX30-II). Ferrari Precontraint 1202 Fluotop T2 fabric provides more strength than the 902 and 1002 and is considered a type III fabric. The same fabric styles exist in type IV and V strengths, 1302 S2 and 1502 S2 with corresponding TX30 versions. These fabrics are used for the most demanding tensile applications with high prestress and working stress levels. If you are interested in using Serge Ferrari fabrics for your structure or have further questions, we will be happy to help with fabric selection and pricing for finished panels. Please fill in the form below, email us, or reach out to one of our experts at (610)435-4720.